S'mores are simple yet delicious desserts and/or snacks. 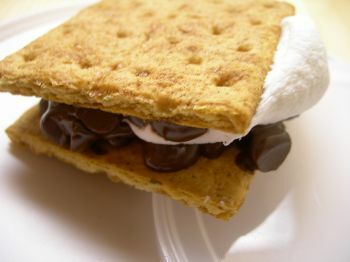 You can vary the flavor of the s'more with a variation of graham crackers. Substitute chocolate grahams or cinnamon grahams--both available at your local grocery store. This minor adjustment makes for a decidedly new-found s'more. The chocolate "glue" sinfully holds this treat together. Instead of a block of hard-to-melt chocolate, use chocolate morsels, a.k.a. chocolate chips. You can easily spread the chocolate all over the graham cracker to achieve an even coating. The marshmallow? Easy. Plop one giant marshmallow in the center, heat and enjoy!